The Hendre Farmhouse B&B01600 740484work01600 740177fax Guest AccommodationA warm welcome is assured at this relaxing farmhouse overlooking meadows and hills, where the present family has lived since 1885. The bedrooms and lounge combine traditional charm with modern comforts. Delicious home-cooked meals are a highlight and are available by arrangement. A warm welcome is assured at this relaxing farmhouse overlooking meadows and hills, where the present family has lived since 1885. The bedrooms and lounge combine traditional charm with modern comforts. Delicious home-cooked meals are a highlight and are available by arrangement. 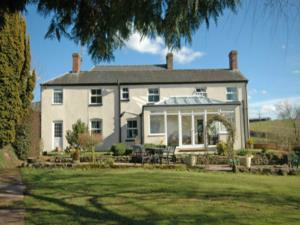 Home cooked meals are taken in a spacious dining room overlooking the large garden and farming countryside.